Prime minister of Great Britain and Northern Ireland (1997- ). Born Anthony Charles Lynton Blair, he was educated at schools in Durham, England, and Edinburgh, Scotland. He then studied law at St. John’s College in Oxford, England, before becoming a lawyer specializing in trade union and industrial law in 1976. Blair began his political career in 1983, when he was elected to Parliament as a member of the Labour Party. He quickly advanced to the party’s front ranks during the Conservative administration of Prime Minister Margaret Thatcher (1979-1990), when Labour was the major opposition party. He was favored by Labour leaders Neil Kinnock and John Smith; they believed his more moderate positions would appeal to British voters, who, beginning in the 1979 general elections, had started to turn away from Labour and its pro-trade union policies. From 1984 to 1987 Blair was opposition spokesman on treasury and economic affairs. He then moved to various posts in the Departments of Trade and Industry (1987), Energy (1988-1989), and Employment (1989-1992). In 1992 he was promoted again, taking charge of domestic issues in the Labour Party’s counterpart to the governing Conservatives’ cabinet. After party leader John Smith died in May 1994, Blair was chosen to take his place. Almost immediately, Blair began working to make the party more mainstream, lessening its dependence on labor and trade unions and broadening the party’s membership. In 1995 and 1996 the “New Labour” party, as Blair called it, rapidly gained in popularity, while at the same time a long economic recession and several scandals drastically reduced support for the Conservatives. 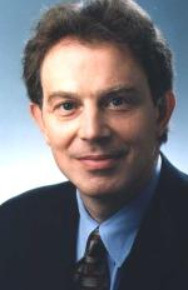 This rise in popularity culminated in a landslide victory for Blair and the Labour Party in the May 1997 general elections. Labour had its best showing in the history of the party, garnering almost 45 percent of the vote and coming away with 419 seats and a 179-seat majority in the 659-seat House of Commons. Blair became the youngest prime minister in almost 200 years. After taking office, Blair pledged to abide by federal spending limits and programs established by the Conservatives. At the same time, he launched ambitious new programs, calling for better relations with the European Union (EU), separate parliaments for Scotland and Wales, and health care reform.